I had these cute summer photos of Moose that I had been waiting to scrapbook. 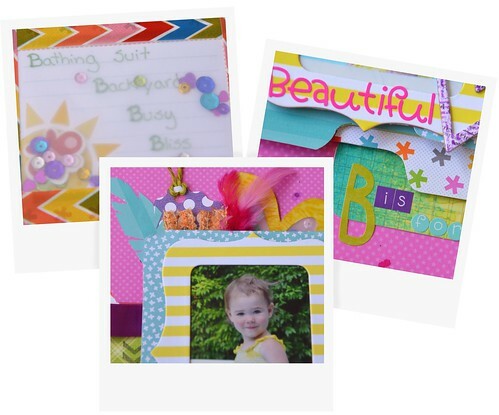 I just love all the bright colored paper and embellishments. Well, I found this neat scrapbooking Tic-Tac-Toe challenge on SWAT. I went for the diagonal and stamped on it, used ribbon, and used 3 different manufacturers (Papers from the take note from doodle bug, playground from echo park, and Sketchbook Bailey's Brush from Amy Tangerine). Of course I needed a sketch to help bring it all together so I found one over at Scrap Friends. The only thing was that it was a one photo layout. So, I turned it into a little mini book to get all the photos I wanted on it. The photo of my daughter looking at her bellybutton inspired the title and all the rest of the b words. I used lots of different embellishment that I had and a bunch that I made. The yellow heart was actually my first attempt at a shaker box that didn't come out too well, but hidden behind a bunch of other embellishments it looks a whole lot less weird then it first did. I love how bright and fun this layout is! The flip up mini-book is such a great idea, too. Thank you so much for participating in our SWAT challenge! love the colors and the misting!!! Thanks for linking up with Swat. 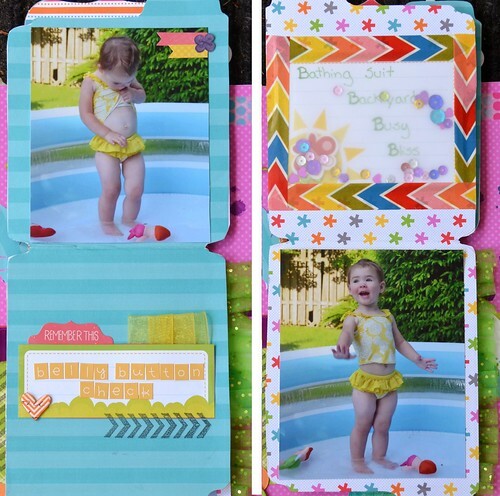 CLever, clever, clever idea with the little booklet...& those colours are just totally YUM...I LOOOVE brights! They work so well with our Scrap Friends sketch, too. Love your work:):) Thanks for joining us at SF!!!!!!!!!!! LOVE your mini!! Such a clever way of incorporating extra pictures onto a layout!! Thanks for joining in on the fun at SWAT! This is SO SWEET and DARLING- I love it!!!! Thanks for playing along with SWAT! Love-Love-Love its so bright and beautiful! Thank you so much for playing along with us at S.W.A.T! Darling layout! I love it! The colors are so bright and cheery! Thank you for joining us at S.W.A.T.! What an adorable layout. Found you on the SWAT page link up. I am your new follower via GFC. Love connecting with other scrappers. Stop by and say hi and follow if you want. WOW Love it . 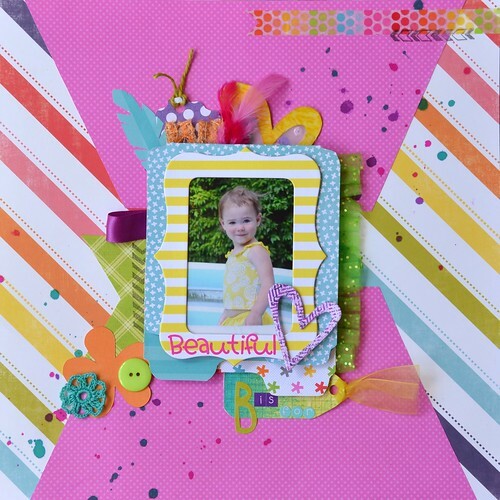 This page is so colorful and sweet little girl!!! this is such a fun page ! love the bright colours! thanks for playing along with us!! Love love these bright vibrant colors. Thanks for playing along with us at SWAT!